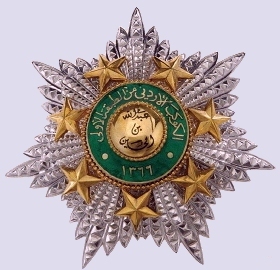 The Order of Hussein ibn Ali (Wisam al-Hussein ibn Ali): founded in honour of his father, by King 'Abdu'llah I on 22nd June 1949. The Grand Cordon class was introduced by King Hussein on 23rd September 1967. Awarded in two classes (1. 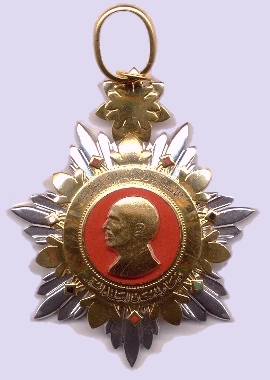 Qiladat al-Hussein ibn Ali - Collar: awarded to Heads of State, and 2. Grand Cordon: awarded to consorts of heads of state, senior Jordanian and foreign princes and princesses). 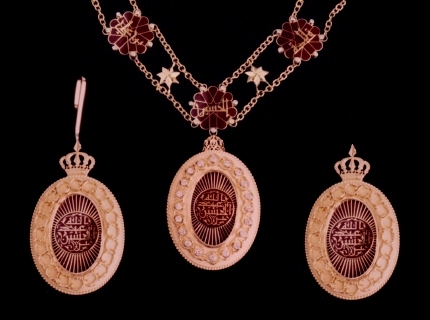 The Order of Hussein ibn Ali - collar & collar badge (A), sash badge (L) and breast star (R). The Order of the Renaissance (Wisam al-Nahda): founded by King Hussein of the Hijaz in 1917, in honour of the Arab renaissance following the revolt against Turkish rule and to reward those who served in the war of liberation. Appropriated and modified by King 'Abdu'llah I of Jordan in 1925, with the permission and approval of his elder brother King 'Ali ibn Hussein of the Hijaz. The order is awarded for the highest civil or military services to the Kingdom of Jordan. It comes in a special class (Mourassa - Grand Cordon in brilliants - reserved for Royalty and foreign Heads of State) and five ordinary classes (1. Grand Cordon, 2. Grand Officer, 3. Commander, and 4. Member Fourth Class). Attached to the order is a silver medal. 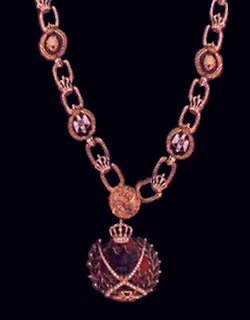 The Order of the Renaissance - Grand Cordon (special class), breast star in brilliants. The Order of the Renaissance - Grand Cordon, breast star (L) and sash badge (R). 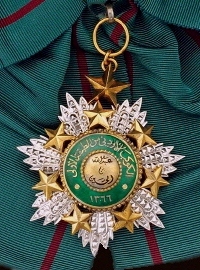 The Order of the Hashimite Star. 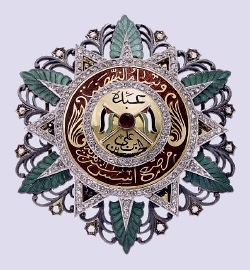 The Order of Military Gallantry (Wisam al-Iqdam al-Askari): founded by King 'Abdu'llah I in 1946 to recignise acts of gallantry by members of the Jordanian armed forces. Amended and updated by King Hussein. Awarded in three classes (1. Class I in chromium, 2. Class II in silver, and 3. Class III in bronze). 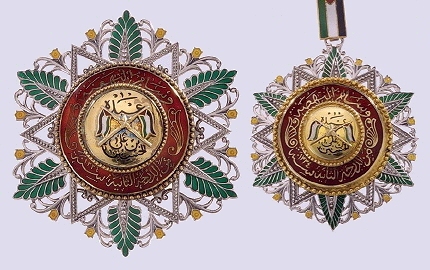 Al-Hussein Order of Military Merit (Wisam al-Istahaqaq al-Askari al-Husayniya): founded by King Hussein in 1976 to reward distinguished services by members of the Jordanian armed forces. Civilians may also receive the order in reward for exceptional services in the defence of the kingdom. The order is awarded in five classes (1. Grand Cordon - awarded to general officers and above, 2. Grand Officer - awarded to full colonels and above, 3. Commander - awarded to field officers and above, 4. Member Fourth Class - awarded to officers below field rank, and 5. Member Fifth Class - awarded to other ranks). 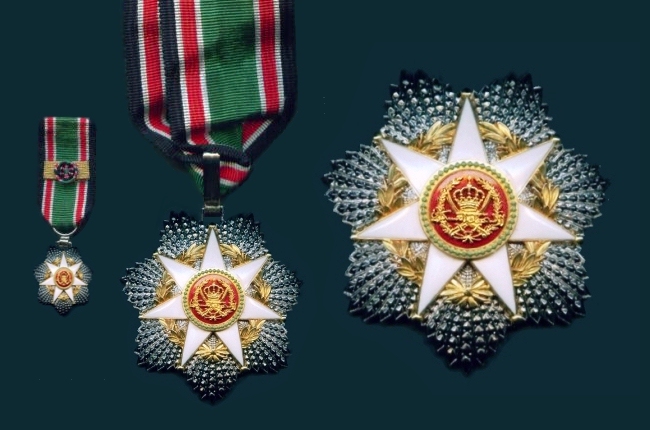 Al-Hussein Order of Military Merit - Second Class, miniature badge, neck badge and breast star (L) - Fifth Class, badge (R). 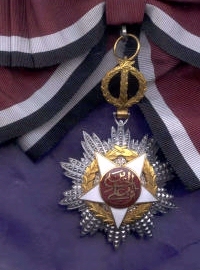 Al-Hussein Decoration for Distinguished Service: instituted by King Hussein in 1976 to reward distinction and achievement in particular fields of endeavour, including philanthropy, literature, the arts, science, scholarship and education, industry and commerce, or public service. Awarded in three classes. 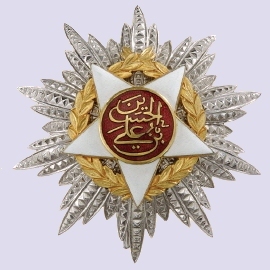 Al-Hussein Decoration for Distinguished Service - First Class, sash badge.